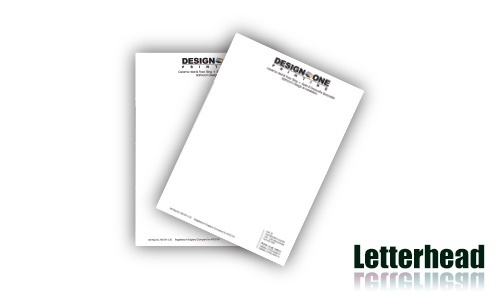 A letterhead is a special heading that is printed at the top of paper. They are often used as letters or for business purposes. Letterheads typically have a name, an address, and the business logo. Incorporated in the letterhead is some type of unique design… Let Design One Printing in Las Vegas create your custom letterhead! Design One Printing is a Las Vegas based print shop, we handle many types of letterhead designs and printing projects throughout Las Vegas, Henderson, and the rest of Nevada. Your business should have something that adequately represents who you are and what you represent. We can create something that showcases your business and makes you stand out from the rest. Just like business cards are extremely important to your business, letterheads are a great way to have your business stand out from the rest. Is your letterhead lacking flair? Does your letterhead need a major overhaul? Read on for ways to make your company’s letterhead (and name) truly stand out. First, consider the type of paper your letterhead is printed on. Remember the adage about first impressions. They really do matter. As such, your company letterhead should give the impression that your company is important and going places. In order to convey this, you need to choose a type of paper that makes people exclaim, “WOW!” There are several options here. One is to buy delicate parchment paper. This might be a good idea if you run an antique shop. By giving your letterhead and the paper it’s printed on that classic, “antique-y” feel, your customers are bound to be intrigued and interested in visiting your place of business. Another choice is the heavy, cream-colored, linen type of paper. By establishing your letterhead on this type of paper, your company instantly conveys class and success. Another aspect of your letterhead is the lettering. If you’re the owner of an arts and crafts store, embossing your company name in a delicate calligraphy style will undoubtedly send the message that you know what you’re doing. If you’re in charge of determining the letterhead for a large and ever-growing corporation, you can choose to have the letters emblazoned in a black or royal blue, bold, uppercase print. Yet another way to make your letterhead stand out is to truly customize it by adding a photo in the background. Make the photo light but definitely apparent on the paper itself. If it’s for a corporate letterhead, the image of the building is a great way to garner attention. For an antique shop owner, perhaps a picture of your most prized and valuable antique will be what draws people to your shop. And last but not least, the spelling and formatting of your Las Vegas letterhead is of utmost importance. While this may seem like a given, you’d be surprised to discover just how many letterheads there are that contain errors. A stand-out format that you just can’t go wrong with is centering. If someone sees your letterhead and notices a spelling or formatting error, then they’re going to think that you and/or your company either doesn’t know or doesn’t care what you’re doing. And when it comes to business, that is something you want to avoid at all costs. Need a custom logo? We handle that as well.